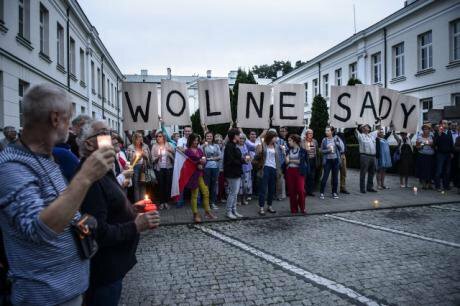 People with lit candles protest outside the Court in Płock, Poland on 16 July 2017. Thousands of Poles have taken to the streets of many Polish cities to protest the politicization of the judiciary. PAimages/ Wiktor Dabkowski. All rights reserved.Twenty years ago, the adoption of a new Constitution by Poland’s National Assembly marked a defining moment in the country’s history. After almost five decades of one-party rule, the Polish people gave expression to their aspiration for freedom and democracy through a set of founding rules protecting citizens from abuses of power and anchoring Poland’s future to human rights and social justice. That future is today at risk, as legislative measures against the independence of the judiciary threaten the very heart of this modern constitutional order. The adoption by the Parliament of a set of amendments to the Act on the National Council for the Judiciary recently is a case in point. By assuming the authority to select the judges who sit on that Council, the legislature gave itself the decisive role in the appointment of judges, thus undermining judicial independence and, as a consequence, the safeguards of citizens against the arbitrariness of power concentrated in a single branch of government. These amendments represent the latest of a series of measures which have been undermining the legitimacy and independence of the judiciary in recent months. Particularly illustrative of the negative consequences of such measures is the creeping politicisation of the Constitutional Tribunal whose composition and rules of procedure have been hastily amended several times. Valid rulings handed down were not published, some disappeared from the Court’s website, lawfully elected judges were not sworn in as others took their place, and public trust in the institution plummeted. Merging the functions of Minister of Justice and Prosecutor General without sufficient safeguards to avoid abuses of power and conflicts of interest was yet another indicator of the growing political pressure on the justice system. Other draft bills increasing the already far-reaching powers of the Minister of Justice over the judiciary, including one envisaging a sweeping reform of the Supreme Court, are currently debated by the Parliament. This disregard for the well-established principles of independence of the judiciary and separation of powers is often explained by the proposition that politicians hold a higher democratic legitimacy than judges by virtue of being elected, and that they can therefore modify all the rules at will. This is both wrong and dangerous. It is wrong, because in a democracy, governments and parliaments do not hold a monopoly on legitimacy. They share it with the judiciary, which is the ultimate guarantor of the rights of the present and future generations and for this reason has to remain independent and impervious to undue political interference. At the same time, it is dangerous because the delegitimisation of the judiciary inevitably polarises society and erodes public trust in all state institutions, a situation which may destabilise the democratic fabric of a country. Legislatures change, political parties come and go – but the judiciary has to remain resistant to power shifts resulting from the electoral process, like a keel that keeps a ship stable on water in all weather conditions. If the keel has imperfections, it must be repaired. But the changes introduced over the last year risk sinking the ship altogether. Elected officials should use their power to propose, make and change laws in a responsible way and make sure that they strengthen the independence, impartiality and efficiency of the judiciary rather than reining it in. They can do so by applying consistently and systematically both the provisions of the Constitution and the relevant international standards. In this context, the Council of Europe Committee of Ministers – the body where 47 European countries, including Poland, take decisions and provide guidance concerning human rights, democracy and the rule of law – adopted a recommendation in 2010 on how to safeguard the independence, efficiency and responsibilities of judges. I find four elements of this recommendation particularly topical for Poland today. First, the executive and the legislature should avoid actions and discourse which may discredit the judiciary or undermine its independence. Second, councils for the judiciary should be independent bodies which safeguard judicial independence and promote its efficient functioning, with at least half of their members who are judges chosen by their peers. Third, unless they seriously breach disciplinary or criminal provisions or “can no longer perform judicial functions”, judges should be vested with security of tenure and irremovability. Fourth, an independent authority or court should determine the liability of judges who fail to carry out their duties in an efficient and proper manner, without the involvement of political bodies and in full compliance with the principles of a fair trial. These principles have been established to allow independent judges to protect citizens from arbitrary use of government power. It is therefore in the interest of the Polish people that their government and Parliament stop undermining the judiciary and uphold the constitutional order.